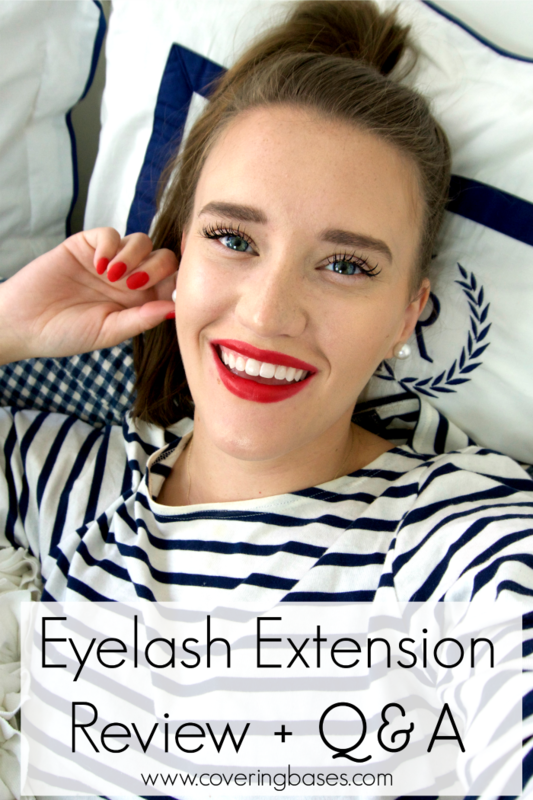 I've gotten so many questions and emails about my eyelash extenstion and experience that I thought I would do a full review for you guys! Read and see more below! Where do you get your eyelashes done? I get them done at SheWinks in Midtown, NYC. I was referred there and they do a great job! You can also get 10% off with KRISTA10 as a one-time code if you go. What type of extensions do you get? I get Volume 2D lashes, C-curl, lengths 9 and 10 (for a little bit of a cat eye) and I only get them on my top lid. I exclusively use Bella Lash extensions as well! Not at all. They feel like nothing! It all depends on how long your natural lashes stay for. Some people have a quicker cycle than others (I've found mine last three weeks before needing a refill). If you take care of them, they last a lot longer. Can you wash your face? What about the ocean? Yes, but not with any oil-based products. When I wash my face, I try to avoid putting anything on my eyelashes other than items specifically made for them (more on that below). I've also been in the ocean with them many times and haven't had any major problems. You just need to take care of them once you're done for the day. What's the biggest challenge with having them? Probably not being able to scratch my eyelids like normal. Weird, but I feel like that has been the hardest part. You really can't rub your eyes and have to be careful when your drying your face. But you get used to it after a while. What's the best way to take care of them? Aftercare products are essential! I brush my eyelashes every morning and night (and whenever else they need them) with mascara wands. You can get these anywhere but I currently use these since they come in a big pack! As for cleansers I have a makeup remover/lash cleanser and a deep cleanser. I use the lash cleanser about every other day to two days, when I feel my lashes could use a good cleaning from oil and everyday wear in the city. I don't wear makeup on a daily basis (or really ever) so this isn't needed as much as someone who does, but it definitely helps to have! I just pump one or two pumps onto a wand and brush/clean my lashes this way. For the deep cleanser, I keep this in the shower and use it about every other week. It's a much thicker substance and you really have to be gentle when using it. I found this was the most helpful on vacation when I was using a lot of sunblock and going in and out of the ocean. With all of that said, the product I SWEAR by is this intelliSeal eyelash sealer. It's a serum that you brush on your eyelashes to make sure the adhesive stays on while also promoting lash growth. I went one time without it, just to see how they hold up on their own and I really was shocked. They fell out SO much quicker and I was worried I wouldn't make my full two weeks (when I can make it for three). So if you buy anything, get this!! They also gave me this infinity lash serum that helps your lashes grow (the new ones that are coming in) but I'm honestly really bad at remembering to do this! To buy any of these you just make a basic account on their website. ALSO you can get 20% off your order with the code KRISTA20. It lasts for a month so be sure to use it while you can! I answered more questions in the video above so be sure to watch that as well! One of the hardest things (I think) about getting them done is finding a place you trust. I asked my contact at Bella Lash who they recommend for my top 10 most popular reader demographic cities. So below are recommended stylists in your area (and email me if your city isn't below) with a way to contact them! Do you have somewhere to recommend for the Raleigh area in North Carolina?! Once I heard about this idea, I fell in love. I haven't done it yet, but would really like to gice it a shot. Love your review! Will definitely be reposting. I use Bella Lash in the salon and will never switch to another company! I notice an incredible difference in my clients that use the intelliSeal and the ones that don't. Their lashes grow like crazy and they're so much stronger! I'd also love a recommendation for the Raleigh/Durham area in NC! Love this! I've dabbled in lashes before and HATED them! I could feel the chunks of glue and ended up pulling them off. I was just about to email Bella Lash to ask for a reco for someone in the Hartford, CT area but if you have a direct line into someone, could you let me know? I definitely want to try again! Your review was super helpful, thanks for sharing! Good to know! I'm planning to get them soon! Great post! Thanks for all of the info. Loved the review. I'm going to have to try lash extensions myself now!